Friday, 1 February 2019, is the Feast of Saint Brigid, Abbess and Secondary Patron of Ireland. 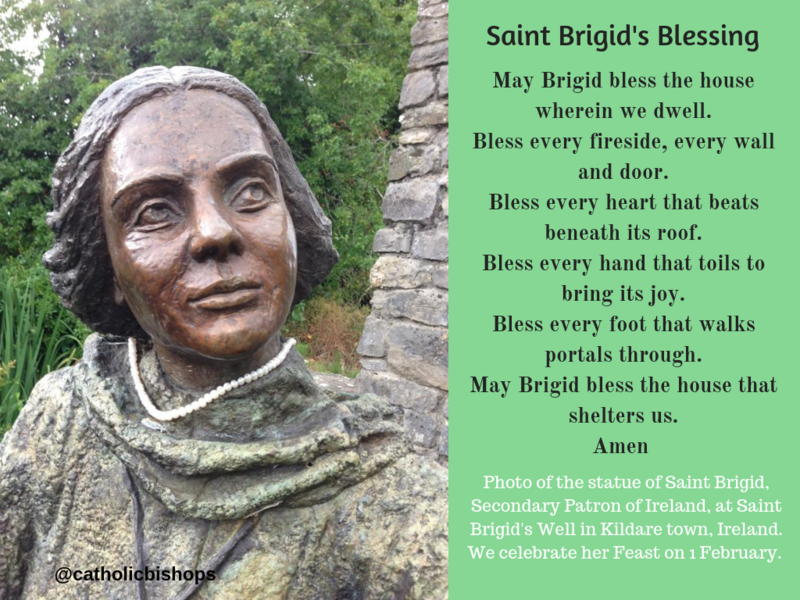 Saint Brigid is renowned for her hospitality, almsgiving and care of the sick. Saint Brigid was born in 454 and she went on to found a double monastery in Kildare with the assistance of Bishop Conleth. The Saint Brigid’s Cross, in legend used by Brigid to explain the Christian faith, remains a popular sign of God’s protection. Please see below some resources for the Feast of Saint Brigid. We praise the Lord Jesus Christ who led St. Brigid along the paths of Justice and holiness; and pray that we may follow his way. Response; Lord, be our light and salvation. Through your resurrection, Lord Jesus, new light came into our darkness – let your Church be a light to the world. At the springtime of the year we renew our hope – give us the grace to encourage all whom we meet today. Brigid dedicated her life to prayer and service – bring many more women to give their lives to the dedicated service and holiness of religious life. Lord Jesus, you gave Brigid the desire to serve and not be served – may we spend our lives in the service of others. You made the word of St. Brigid fruitful; – give success to the work of our hands. 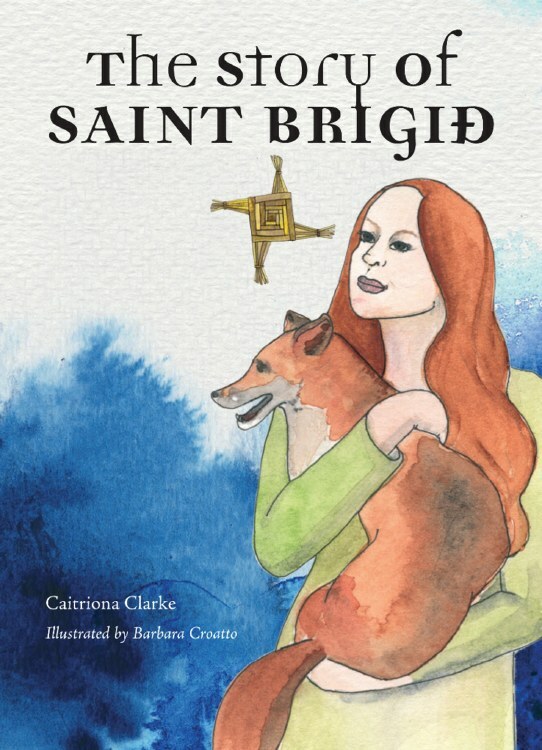 The Story of Saint Brigid is a colourful new book from Veritas. It tells the story of the life of Saint Brigid, one of Ireland’s three patron saints, known throughout the world for her love of and service to the poor, the sick, the elderly, the environment and animals of all kinds. Read the fascinating story of her life and find out about the origins of the Brigid’s Cross and St Brigid’s Well in County Kildare, where she founded her most famous monastery. This book is suitable for children aged seven to ten. It is written by Caitriona Clarke and beautifully illustrated by Barbara Croatta. For more see www.veritas.ie. 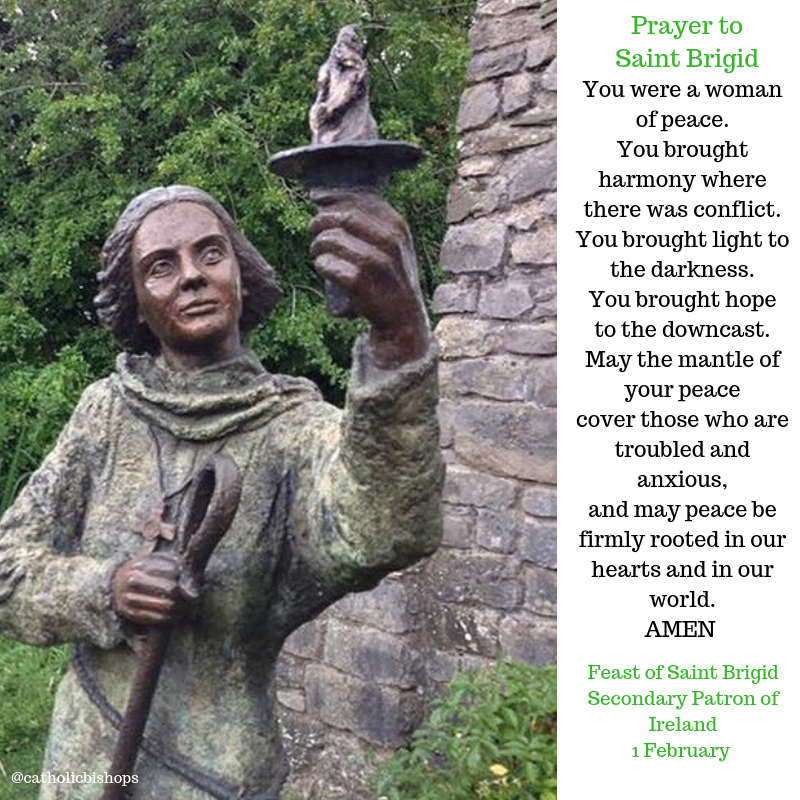 Wishing you all blessings for Saint Brigid’s Day.